This article by the New York Times highlights some advantages to eating fish. To clarify, fish are also considered meat so the question asked in the title refers to other types of meat that may be less healthy. As mentioned in this article, the Dietary Guidelines in the United States recommends eating 8-oz of seafood per week as part of a healthy diet. Why is this? Strong evidence from recent studies suggests that eating patterns that include seafood were associated with a decreased risk of cardiovascular disease and may even be associated with a reduced risk of obesity. Fish are lean and low in saturated fat compared with other animal protein sources. Oily fish, such as salmon and tuna, are high in Omega-3 fatty acids which are heart healthy and may also reduce the risks of cardiovascular disease. 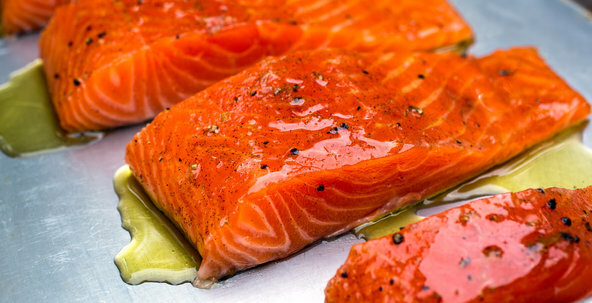 As the article states, fish is also recommended because of it’s total nutrient package which includes “which includes lean protein, vitamins A and D as well as B vitamins, and a host of minerals such as iron, iodine, selenium and zinc.” One thing to keep in mind, is the levels of mercury found in varying levels of seafood and fish. Mercury is a heavy metal that can be damaging to your health, especially children under six, developing babies, and women who are pregnant or breastfeeding. Check out this article to read more about fish. You can also visit The Environmental Working group here for a list of seafood high in Omega-3 fatty acids but low in mercury. Hi there, I check your blogs daily. Your story-telling style is witty, keep doing what you’re doing! Thanks to my father who shared with me about this blog, this webpage is in fact awesome.